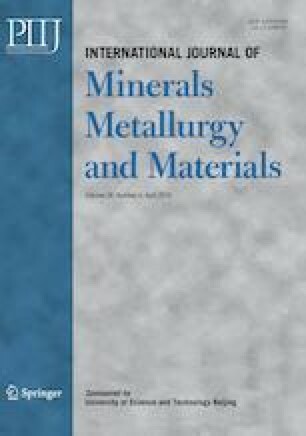 The aim of this study is to apply process mineralogy as a practical tool for further understanding and predicting the flotation kinetics of the copper sulfide minerals. The minerals’ composition and association, grain distribution, and liberation within the ore samples were analyzed in the feed, concentrate, and the tailings of the flotation processes with two pulp densities of 25wt% and 30wt%. The major copper-bearing minerals identified by microscopic analysis of the concentrate samples included chalcopyrite (56.2wt%), chalcocite (29.1wt%), covellite (6.4wt%), and bornite (4.7wt%). Pyrite was the main sulfide gangue mineral (3.6wt%) in the concentrates. A 95% degree of liberation with d80 > 80 µm was obtained for chalcopyrite as the main copper mineral in the ore sample. The recovery rate and the grade in the concentrates were enhanced with increasing chalcopyrite particle size. Chalcopyrite particles with a d80 of approximately 100 µm were recovered at the early stages of the flotation process. The kinetic studies showed that the kinetic second-order rectangular distribution model perfectly fit the flotation test data. Characterization of the kinetic parameters indicated that the optimum granulation distribution range for achieving a maximum flotation rate for chalcopyrite particles was between the sizes 50 and 55 µm. F. Kazemi, A. Bahrami, and J. Abdolahi Sharif, Determination of the difference in recovery and kinetics of various size fractions of gilsonite in rougher and cleaner flotation processes, Int. J. Min. Geo-Eng., 53(2019). https://doi.org/10.22059/IJMGE.2018.256299.594732.